Kerala has everything to offer you form the natural resources to man-made amenities. Though Kerala have many beautiful beaches where you can lay down for hours and have fun through water sports and adventure games; still you have another option to relax your body and soul in the Private Pool Villas of many Keralian Resorts. 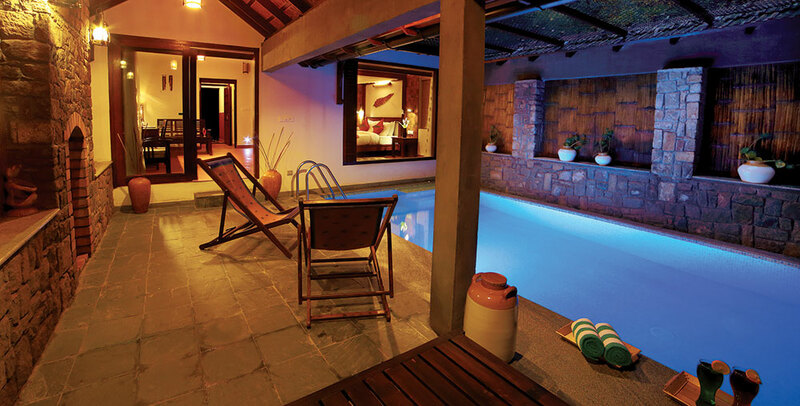 These Kerala resorts offer you a private pool-side cottage to stay in with various other facilities at a call away. You can drink, dance and dine altogether, use high speed Wi-Fi to maintain your connectivity with family and friends, enjoy the sightseeing in day hours, poolside breakfast-lunch-dinner and campfire in the night. 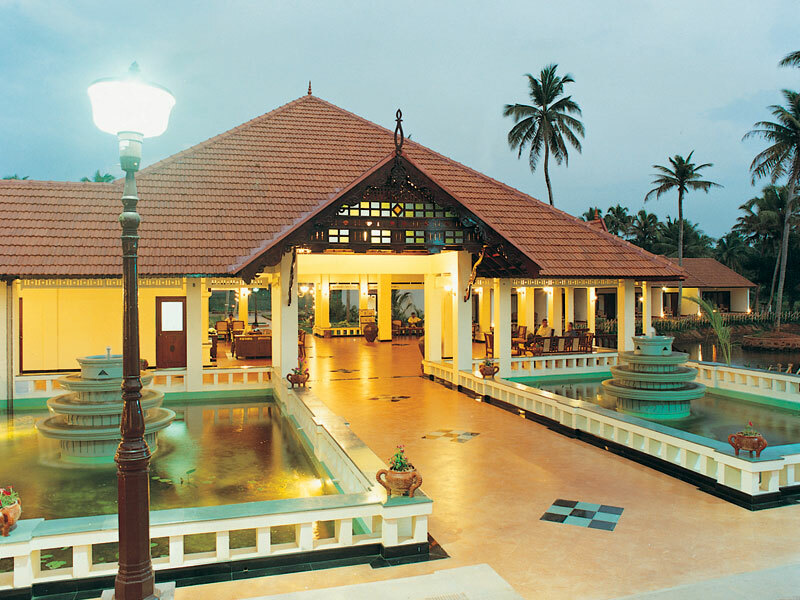 No matter for whatever reason you are in Kerala, the stay in this resort will give you immortal feelings. The Private Pool Villa available here offers the most pleasing view of lake meeting river. Premium Lake View Villas have exceptional lake view from the bedrooms and are equipped with traditional furniture. Welcoming, polite and proficient staff goes beyond their way to make your vacation in the resort flawless. Relax in the comfy Jacuzzi and relish the flavors of Keralian cuisines along with various intercontinental dishes served. Resort also has a spa, library and mini gym to give your body all the soothing elements together. Spend your leisure hours in fishing. Yoga sessions in the peaceful environment of the lake are enchanted. Though they have 6 categories of rooms but if you are seeking for pool-side private villa ask for Rithika Honeymoon Villa, Indeevaram-Premium Pool Suite without Warm Pool or Indraprastham-Presidential Pool Suite with Warm Pool. With an elegantly equipped living room and king-sized bedroom in coordination with the nature outside they offer you the Haven on earth. Involve yourself in the resort’s activities such as Thekkady Show, Ethnic Cuisine Demonstration, Plant a Tree Programme and lot more on the list. They will not let you down with resort’s facilities including a mini gym, swimming pool with a pool for kids, Wi-Fi in all rooms, Trampoline, Tree Top Coffee Shop, Multi-cuisine restaurant and protected children’s play zone. It is a famous travel terminus situated 16 kms from Kottayam; renowned for its backwoods leisure industry. It is set in the surroundings of the Vembanad Lake which is the biggest lake in Kerala. It has a temperate climate all over the year and hence vacationers keep visiting the place. It has directly influenced the accommodation options available in Kumarakom. A few among them are Kumarakom Lake Resort, The Zuri-Kumarakom Kerala Resort & Spa, CGH Earth – Coconut Lagoon and lot more. It is designed in a way so as to sooth you while you are on vacations. Ragamaya has 18 sophisticatedly prearranged lake view rooms, supplemented with class apart services which blend efficiently with the lavish spread of natural ambiances. Ayurvedic sessions and transnational spa comprising various massages and facials are worth having. You can relax your body in the Jacuzzi spa suite, with or without a healing session. Despite treat your-self in the swimming pool, with free Wi-Fi, and multi-cuisine restaurant as well as in-house bakery. You have ample of activities like Fishing & Canoe Rides, BBQ & Candlelit Dinners, Cycling, Ethnic Cooking Classes, Trekking & Hiking, Tea Factory Visits, Yoga & Meditation etc. The Honeymoon Pool Villa made here is furnished with a private swimming pool and a sun deck on the basement floor besides a glass floored bedroom on the floor above, along with a small living room. A mini fridge and availability of Hot and Cold water makes your stay more comfy whereas the Pool Villas offer a private pool, bedroom, a recessed living area and a safe kids’ room on the top floor. The Honeymoon Villa has huge verandahs, a living room and furnished dive pool with hot water Jacuzzi built-in bath. Located at the entry to Muziris, this culture capital of Kerala is 25 kms from Cochin International Airport has a variety of Private Pool Villas to accommodate you. 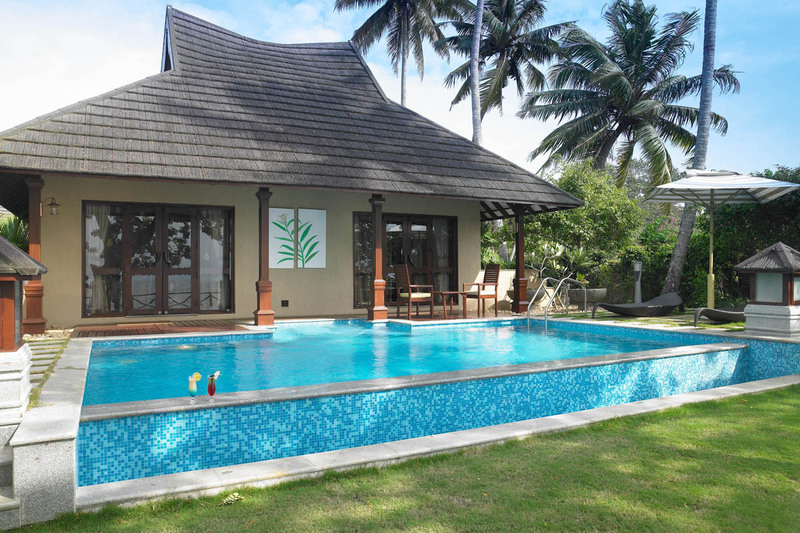 The Pool Villas are located beside the bank of the backwoods are equipped with a Jacuzzi and a Mini Pool. Next they have Fishermen Villas made with natural products like coir, cane, thatched roof with palm leaves and much more. The mild wind from the sea and the backwoods chills the room certainly. The Sunrise Villas are outlandish independent villas with a wonderful view of the boondocks. All these villas are completed with Wi-Fi, Mini Bar, Tea/Coffee Machine, LCD and other amenities. 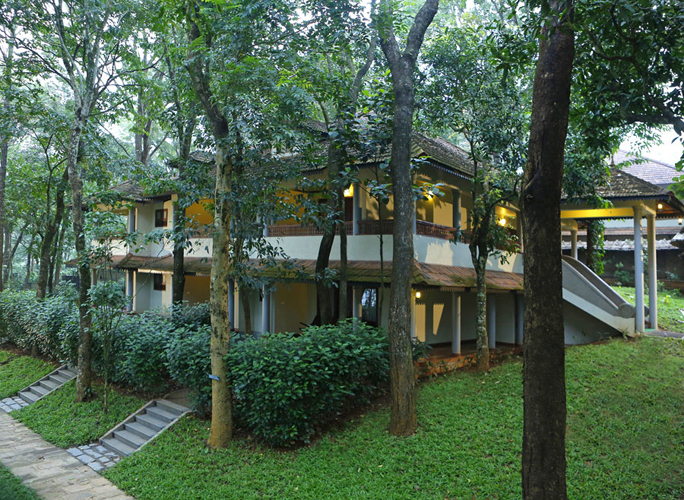 This being the most exotic resort in Kerala is situated on the banks of Vembanadu Lake. The Bamboo Pool Villa has free Wi-Fi and breakfast. It also offers a private pool, Bathtub, Coffee/Tea Maker, LCD etc. whereas the other villas available here either offer a Jacuzzi or a Bathtub with other room facilities. 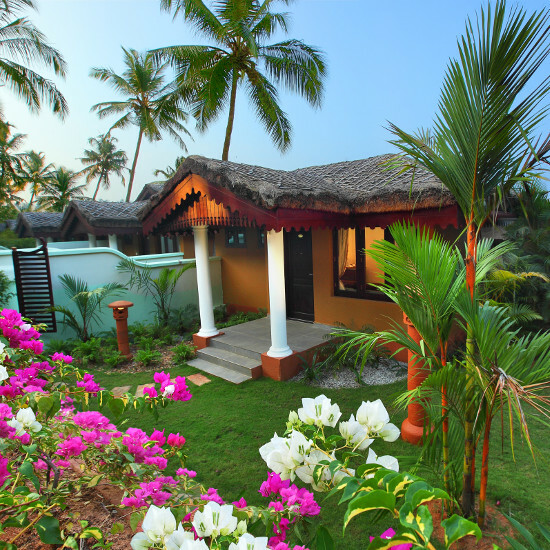 So, plan your Kerala trip now and select the best suited private pool villa as your accommodation. Dive into the freshness and calmness of the environment and have a happy vacation. Looking for for two rooms 1 family with 4 adults for 2 nights. One with private pools. 25 Dec for 2 nights. An amazing article to read.Thanks a lot for sharing this. Fine work.Keep it up. Srees Tours & Travels – Owned by Mr Sreekumar MP, who served the INDIAN ARMY from 1984 to 2004. Posted to Defence Wing of Indian Embassy, Stockholm, Sweden.